Dance Spirit: What got you interested in Oklahoma!? John Heginbotham: I grew up with musical theater. It was my introduction to entertainment and to the performing arts, and Oklahoma! was one of the first movie musicals that I ever saw. There was always a soundtrack playing in my house, and we'd watch tons of movies. I was extremely excited to be asked to be part of this version. DS: What's the choreography like? 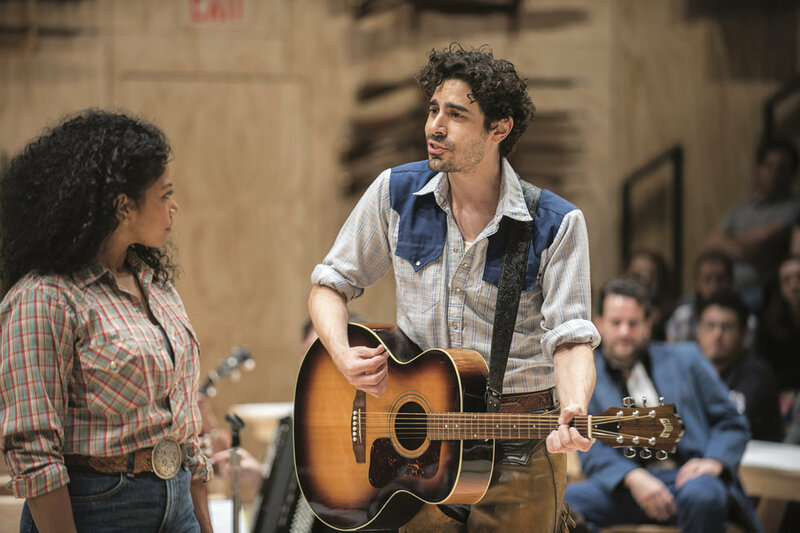 JH: There's quite a bit of dancing in the revival, but a lot of it's based on social dancing: two-steps and country swing, things that you might see at a community center in the South. The beauty is that everybody brings their personality to the moves. That's how it would be if you were at a dance party; everybody kind of dances in their own way. The one exception to that is the dream ballet, which is performed primarily by a single performer, Gabrielle Hamilton. DS: How did you approach the dream ballet? JH: Our way into the dream ballet is through this one performer. She's purposefully ambiguous, and the intention is that the audience is free to associate and interpret what they're seeing. The vocabulary features quotes from Agnes de Mille and her original dream ballet, and images that were previously mundane in the show presented in much more sinister or fantastical ways. It's a surreal sequence that for me follows dream logic. I'm hoping it's going to feel startling, but also tender and lovely. DS: Was it intimidating to choreograph your own version of a piece so many people know and love? JH: Yes, 100 percent. Agnes de Mille broke serious new ground with the dream ballet, and she made a strong case for what the place of it should be in the show. We're doing something that's really different, but I think it's true to her intention—'What is going to advance the plot, or the momentum, or the arc of the show?' I would say that if somebody pays a lot of money expecting to see an arabesque, they will not be very happy. A version of this story appeared in the April 2019 issue of Dance Spirit with the title "Oklahoma! Heads to Broadway—in a Brand-New State."